Sweet 16s like Quinceaneras is the celebration of a young lady's transition or journey from childhood to womanhood. It is the milestone, that symbolizes the coming of age in North America and Canada. The celebration can range from at home parties to large affairs focusing on God, family, friends, traditions, food and music. I had the honor of being the coordinator of Natalie's sweet 16 this past weekend, and even though the whole event was in Spanish, I had a pretty good idea what was happening because I ran the show. The 250 guest event was a nice extravagant affair with traditions and customs which began with a family brunch before mass at the family's church. The party officially started when the sweet 16 girl made her entrance, performed several dances with her 6 guy court before mother placed a tiara on her head to declare her a princess, and her father took care of the "Changing of the Shoes," by replacing her flats with high heels. The family opted not to include the "Lighting of the Candles." 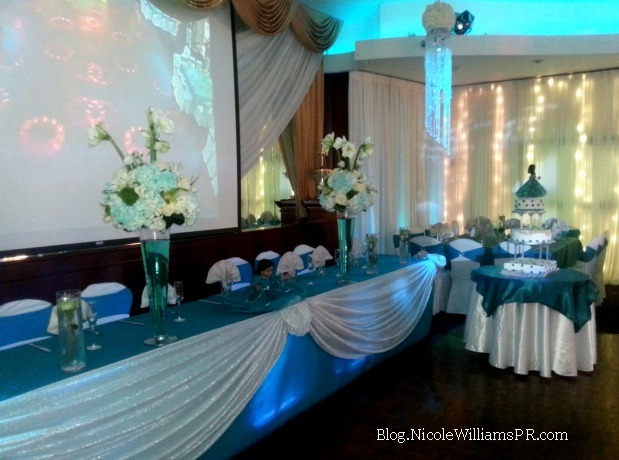 The event was set in the elegantly decorated Princess Manor venue and featured a DJ and the Mariachi band who sang happy birthday to the princess and kept the guest entertained. The sweet 16 girl who wore a ball gown and changed into several outfits for her performances, was presented with the last doll by her brother. Mother and daughter during the speeches and toast to present the sweet 16 girl to her guests as a young lady, got really emotional and almost had me in tears. No matter how you and your teen choose to celebrate this rite of passage, be sure to be unique by experimenting with customs and traditions to make the celebration a lasting memory. To receive more event tips and inspiration like this straight to your inbox, be sure to signup below for our weekly NEWSLETTER.